SQUIDALICIOUS: Do Not Buy My Kids Another Barbie, Please! Iz has a doll drawer that she only opens when she is gifted another doll and needs a place to put it. Leelo broke the drawer by using it as a step stool, so I had to empty it. Here are all its innards. If they disappeared Iz would never realize it. This display is sick and wrong to me on so many levels. Not even getting into body image mental contortions or the kind of labor involved in making such complicated micro-garments on a doll that sells for $5. This is a good example of why I ask people not to bring obligatory presents to our birthday parties. We prefer company to gifts, though sincere and thoughtful generosity is always appreciated. 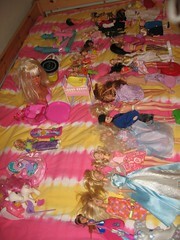 Anyone who wants a Barbie, let me know.